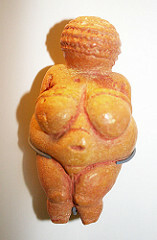 An ancient maturity doll, most likely used to provide good fortune for female reproduction. The figure stands about 4in tall and is certainly not a goddess. Her features are defined in the regions most important to reproduction. These ancient paintings of bulls line the roofs of the Altamira Caves. They were found by the daughter of an amateur archaeologist in 1879. There are many questions about why these ancient people drew bulls, horses and other animals. One such idea was that they were to show tribute to such powerful animals (Strub accpeted). The second is that these were priest paintings to bring good fortune upon hunters (less likely because in many cases, the ancient people did not hunt these animals). 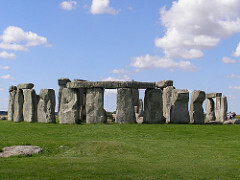 An ancient use of post and lintel structures to create a henge. Three consecutive circles, lining to a alter stone in the middle, that the sun hits after it passes through the heel stone in order to track and calendar solar time (for agriculture). Outer stones are made of sandstone and inner stones are made of blue stone (tough to find, far away and tough to break). 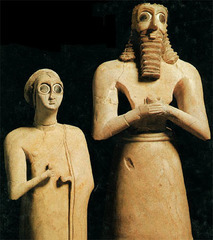 The figures are statues usually owned or ordered by wealthy Sumerians who had the money to have a carver inscribe them into stone. Their wide eyes and poses denote that they are praying to the Gods that may reside in the sky. This continuous praying both is meant to please the Gods to bring the individual good fortune. The figures are indicative of the culture, the expressions are that of fear and a pessimistic world view that the world is out to hurt them. The idea is the Gods are the only ones who can save the people from bad fortune. The lyre is an instrument, much like a harp that in this case was never meant to be played. The instrument was most likely buried with a royal member such as a king. This is assumed since the beard of the bull is made of lapis lazuli, a rare, hard stone to carve. In addition the head is covered in gold leaf. The wood box has been reconstructed but the plack in the front is original and depicts a beast in celebration of the life of the king through a feast. The stele is depicting the great warrior of Naram-Sin. This is a type of propaganda in the sense that the use of hierarchical scale to show the warrior’s power. 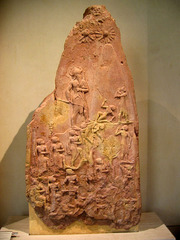 Naram-Sin is displayed larger, in the middle climbing the mountain of dead/mangled bodies (that he has presumably slayed) to reach the two suns at the top of the stele. The suns represent the Gods which may offer a sense of divine power. We can further see Naram-Sin’s power through his wearing of bull horns (a virility symbol). An approximately 750ft tall bay salt (hard stone) pillar with a stele at the top. The pillar is marked with actions followed by the resulting harsh punishments. The idea was to minimize conflict, since Hammurabi herd all cases, before walking in the two parties could see the answer before hand. At the top, the stele depicts Hammurabi standing next to the God Shamash the Sun God. 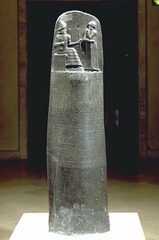 The stele implies divine power that the good Shamash has bestowed upon Hammurabi. 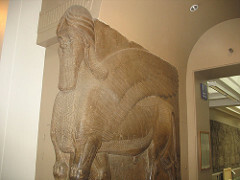 Originally, two opposite facing Lamassu stood on either side of the gate to the king’s quarters. The idea was to show the power of the king and intimidate/display the power of the Assyrians to those who entered. The statue combines three powerful creatures, the horse (body), the face (human) and the wings (mythical or large bird). It also uses twisted perspective with 5 legs so all 4 powerful legs can be seen from any angle and the head is facing to the side and the front while the body follows both. Similar to the Lamassu, this gate is meant to intimidate those who enter. Characterizing the Neo-Babylonean period, where the emphasis is to impress through money and beauty. 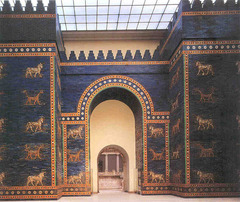 The gate was dedicated to the God Ishtar and shows powerful wildlife (lions, bulls, etc…) all over. It stands quite high towering all humans bellow (similar to a God). A palette was commonly used for mixing, making and applying body paint. Yet this particular palette was for honoring the King of Narmer (Chisel Fish) who combined Upper and Lower Egypt (bringing two animals head together on front). 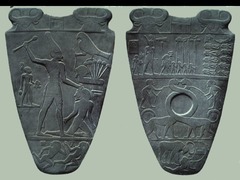 The Palette uses hierarchical scale to show larger Narmer more powerful than other humans. Two gods are also depicted in the Palette, Horus (bird on papyrus reed) and Hathor (2 bull heads/horn sets). This further shows the divine power Narmer has. 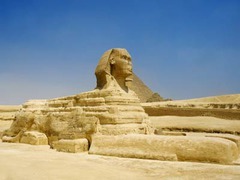 The Great Sphinx is a guardian figure for the 3 great pyramids. It’s purpose is to further impress those who enter or see the pyramids and protect dark spirits or enemies from entering. The face of the Sphinx is Pharaoh Khafre (burred in middle pyramid). The body is of a lion, a powerful creature further showing Khafre’s power and shows him in a traditional Pharaoh headdress. This Serdob Statue pictures the Pharaoh Khafre. The rigid structure and sharp angles highlight the Egyptian ethos of strength and power. The statue is made of diorite and stands well above life life size, showing the effort taken to make the statue. The statue also displays Khafre’s divine power through Horus (in bird form) holding the back of Khafre’s head. 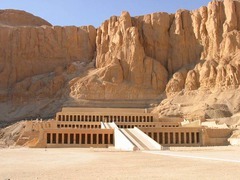 This funerary temple was built for the only female Pharaoh. 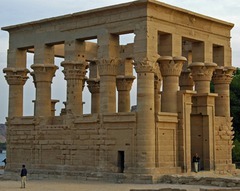 This temple was the first major artistic piece of the New Kingdom, marked by the Pharaoh’s reclaiming power over the Hixos. The temple is organic architecture because of how the temple is built into the mountain side and line’s match beautifully with the structure of the hill side. The hall is a court, crowded with pillars, held together by sheer weight. The pillars have sunken relief which have all the same design and meaning of normal relief while still keeping the structural and geometric integrity of the column intact. 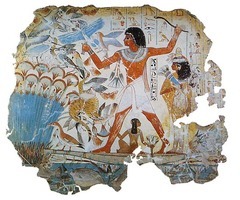 Using a technique of dry fresco, this painting displays Nebamun hunting. Nebamun was a scribe and counter of grain (nobleman) who is hunting in this picture. His wife and kids are displayed in proportion of rank (Nebamun the largest, then wife then kids). The colors and animals are classically found in Egyptian art and the swamps of the Nile river. This statue depicts the the Pharaoh of Akhenaton. He was the creator of the Amerna period where the Egyptian God and capital changed. This picture shows a realistic portrait of the Pharaoh. This realism differed from past Egyptian styles and is in respect to the Sun Disk God who cherished fidelity to Ma’at (truth). The statue shows a mostly unattractive man that scientists have possibly attributed to inbreeding. 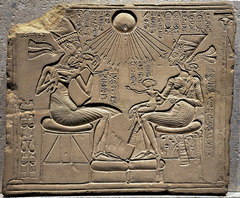 This low relief plate depicts a scene involving Akhenaton , Nefertiti, and their 3 children. Fedelity to Ma’at is still present here with the depiction of the people and how Akhenaton is kissing his baby. Also, the God Aton, the sun disk, is shown at the top projecting his rays of light over the royal family giving them eternal life (Anhk at the end of the lines). 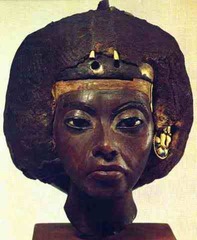 This bust depicts the mother of Akhenaton and who’s bust further expresses fidelity to Ma’at. Her face shows her age through wrinkles and frowning face. Her importance and cherish are also shown through the lapis lazuli earings and her head piece. This is a fragment of a papyrus scroll (from the book of Moore). The scene is the final judgment of whether Hu-Nefer will be let into the “heaven” of the afterlife. He is lead through by a anubis holding a anhk. They will weight his heart here to see if it is lighter than a feather. If so he can pass, if not his heart is eaten by a God.